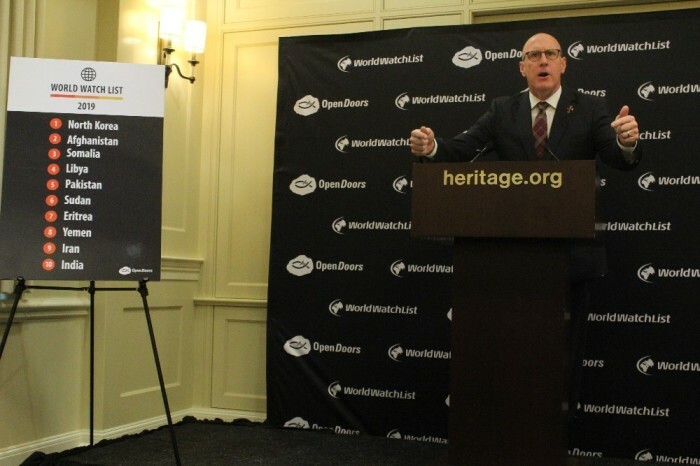 Open Doors USA CEO David Curry speaks during the unveiling of the 2019 World Watch List at the Heritage Foundation's Capitol Hill office in Washington, D.C. on Jan. 16, 2019. Open Doors USA released on Wednesday its annual list of top 50 countries where Christians are most persecuted. Two countries were taken off the list and two were put on this year. Bahrain, a tiny Muslim-majority nation in the Persian Gulf, earned its way off the 2019 World Watch List after being ranked in previous editions because of religious freedom and human rights concerns. In previous editions, the leading international Christian persecution watchdog called out the “relatively religiously tolerant” kingdom of Bahrain for placing inhibitions on the freedom to assembly, prohibitions against Christians proselytizing and restrictions to religious expression. “It is improving their entire society,” he explained. He noted that the removal of Bahrain from the list “reflects that they are doing a better job of telling their story” of tolerance. When asked by The Christian Post what steps the Bahraini government has taken to be removed from the World Watch List, Curry explained that the Bahrain royal family has done a better job of including all minority groups in discussions in the public square. At the first-ever State Department Ministerial on Religious Freedom last July in Washington, a Bahraini official announced the creation of an ambassador-at-large position for peaceful coexistence and religious freedom within its ministry of foreign affairs. In July 2017, Bahrain King Hamad bin Isa Al Khalifa authored and signed “The Kingdom of Bahrain Declaration.” The declaration calls for an end to religious extremism and greater religious tolerance in the Middle East and other places around the globe. In 2018, the king established the King Hamad World Centre for Peaceful Co-Existence. The center is housed in a large building in the center of the capital city, Manama. In 2008, Bahrain became the first Arab nation to assign a Jew to serve as an ambassador to the United States. Even on the gender equality front, progress is being made in Bahrain. In December, a woman for the first time became head of the Bahraini parliament. Bahrain is, however, still listed as a “Tier 2” country of concern for religious freedom by USCIRF. Another nation that was dropped from the World Watch List in 2019 is the East African nation of Djibouti, which was ranked last year as the 50th-worst country in the world when it comes to Christian persecution while Bahrain ranked 48th. Newly added to the World Watch List in 2019 are the Russian Federation (41) and Morocco (35). Though they were not on the 2018 list, they had made the list in previous years. Moore told CP that evangelicals and other non-Orthodox believers like Jehovah's Witnesses continue to face “incomprehensible marginalization and persecution from the government” in Russia as a law passed in 2016 has restricted evangelism and missionary activities.